-Well, finally found the worst pancakes in LA. So far. This weekend I visited Bloom Cafe on Pico Blvd and Sierra Bonita Ave in Los Angeles, CA on, what I must say, was a whim. Wanting to go for pancakes close by with parking and no wait is hard to come by in this city, so we figured Pico Boulevard was the route to go. Well, after visiting Bloom Cafe, I now know why there was ample parking, and no wait. Now, in all fairness, the Yelp reviews do warn you there is a vegan-theme to this restaurant. 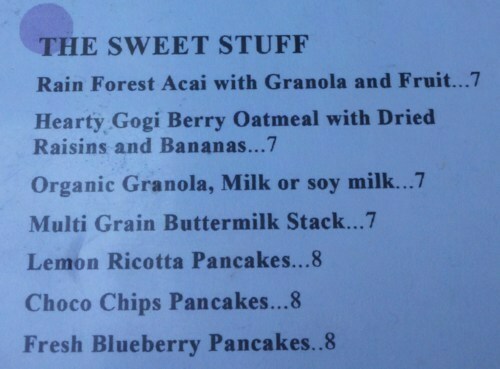 HOWEVER, the menu only lists “vegan” next to several items – these do NOT include the pancakes. So, I figured I was safe. Bloom Cafe has a nice little selection of pancakes, and I was informed the Lemon Ricotta Pancakes are the most popular. I realize I am a pancake-blogger, but I am still not ready to try the Lemon Ricotta Pancakes, a selection I have seen on several menus. I however, opted for the Blueberry Pancakes without the puree on top. 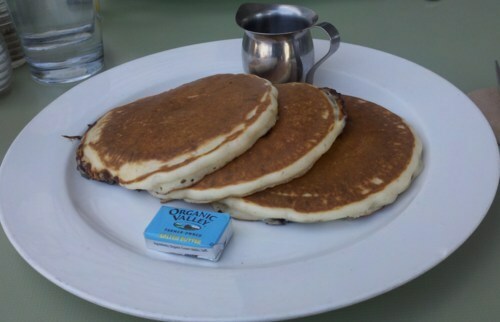 Looking at these pancakes again… it’s just, unfortunate. Judging by the freshness of the orange juice, I thought the pancakes would be fresh, tasty, and crisp. Well, it was quite the opposite experience. The Blueberry Pancakes at Bloom Cafe were dry, dense, and had an (almost) sour aftertaste from the blueberries. Now, if you can recall from my previous reviews, particularly Charlie’s Coffee Shop, I often discuss the importance of pancakes NOT being pre-soaked in butter. Well, you see that Organic Valley square up there? I had to wipe almost the entire piece on these pancakes, just to finish my meal. Not. Good. As you remember from my review at Jinky’s Cafe, pancakes are supposed to say “Good morning, sunshine;” unfortunately, these pancakes say “You’re being punished.” If these pancakes are in fact vegan, soy filled, any of that crap, than A: it should clearly say that on the menu, and B: if this is what it means to be vegan, I will never be a converter. On Saturday I visited John O’ Groats on Pico Blvd and Patricia Avenue in Los Angeles, CA. If some of you recognize the logo, it could be because the restaurant was actually featured in an episode of Curb Your Enthusiasm. From the moment I entered the restaurant, I felt somewhat of a West Palm Beach Florida vibe, particularly with it’s (mainly) elderly crowd, and diner-food aroma. It was at this moment I knew the pancakes would be good, but also knew they would be different than the other pancakes I’ve been reviewing. Well, I was right. While John O’ Groats definitely has a diverse menu, I’m not the biggest fan of fruity-pancakes (i.e. the Applesauce, Mango Macadamia Nut, and Lemon Pancakes), and therefore decided to go with the Clements’ Sisters Chocolate Chip Pancakes- minus the whipped cream. 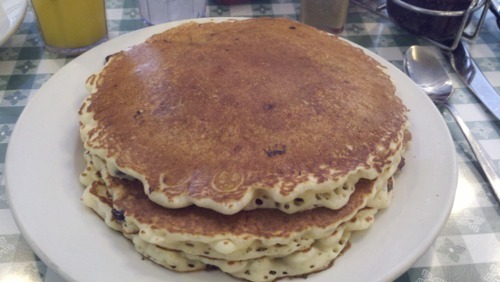 While these enormous pancakes were delicious, and clearly homemade, they definitely tasted like diner-food pancakes. Yes, diner-food pancakes can be amazing (like in this case); but I often think of diner-food pancakes as the solution for hangovers, not so much for Saturday brunch. Granted, many can disagree: sometimes you need that diner-food pancake if you’re homesick, and miss vacation breakfasts with your grandparents in Ft. Lauderdale. But while these pancakes are great for what they are, in a town of such intricate pancakes with varying batters, I can’t say John O’ Groats pancakes are the best ever. Then again, if diner-food is what you’re looking for, go for it! The difference between Chocolate Chip Pancakes from, lets say, Black Cat Bakery, and John O’ Groats’, is that BCB’s pancakes don’t make you feel so full after. I’m not quite sure what the difference is in the batter, but I want to say one has way less grease. 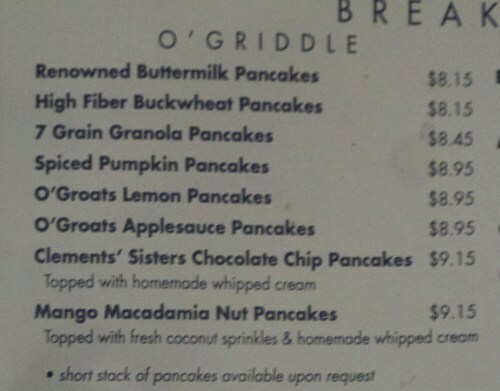 I enjoyed John O’ Groats pancakes and give them a great review for what they are, but I do suggest wearing stretchy pants- otherwise your button will shoot across the room once you’re finished. John O’ Groats has a diverse menu selection, and certainly gives you enough of a portion size for the cost; I just don’t feel that in a town of such an assortment of tasty pancakes, this dish compares. 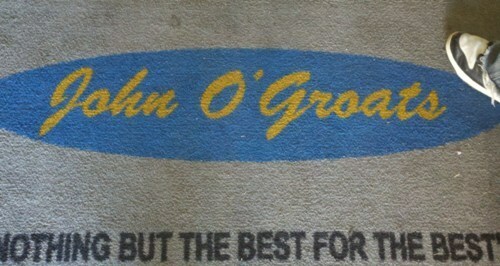 As per their motto, I do believe John O’ Groats gives nothing but the best; but, maybe for the best for the elderly.